The Holiday Market returns to downtown Kannapolis on Nov. 27 & 28. Presented by Downtown Kannapolis Inc. the Holiday Market runs from 10 a.m. to 5 p.m. Friday, Nov. 27 and Saturday, Nov. 28. This will be the ninth year the market has been held in downtown Kannapolis. The market will be held at the old Cabarrus Bank Building, 201 West Avenue, Kannapolis and at Kannapolis Rotary Hall, 211 West Avenue, Kannapolis. This is the first year the event will be held in two separate buildings. Entertainment will be provided throughout the day including carriage rides, Santa and more. 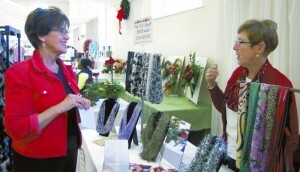 There will be a variety of artisans from soap makers to floral designers. There will also be several wineries from local vineyards to sample award winning wines. Area farmers will provide in season produce, baked goods and many other holiday favorites for the family. For vendor information please visit our web site at www.downtownkannapolis.org.